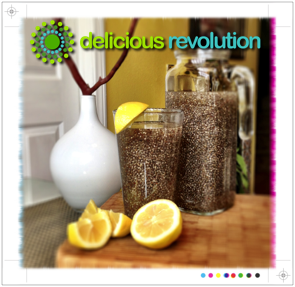 Omega-3 Cheers for Chia Seed Drinks! So what’s the big deal with these little seeds? How can something so tiny do so much for your health? Here’s the scoop on why you should eat chia daily and why I think chia drinks are the best way to consume them. By now you are probably clear that there are three Essential Fatty Acids, Omega-3’s Omega-6s and Omega-9s (labeled essential because our bodies cannot make them). But a lesser discussed topic is the ratio of omega-3s to omega-6s and how an imbalance in these essential fats contributes to the inflammation cycle. As we mentioned in the Turmeric Tonic Recipe post, inflammation is a contributing factor to most chronic diseases. Cancer, heart disease, Alzheimer’s, arthritis, auto-immune disorders, diabetes and so many more are affected by inflammation in the body. So how does the balance of Omega-3s to Omega-6s affect inflammation? Omega-3s and Omega-6s complete for the same enzyme (and 6s tend to be the bully who wins that fight more often than not!). The Standard America Diet is LOADED with 6s (cuz of the cheap, high Omega-6 oils like corn, cottonseed, soy and safflower in so many foods). So while we evolved on a diet with an Omega-3 to Omega-6 ratio of somewhere between 1:1 and 1:4, the S.A.D can be as much as 1:24! When Omega-6s breakdown it should convert to DGLA which also controls inflammation, but when excess insulin is present (as it often is because many of us eat too much sugar) the breakdown rushes on to become Arachidonic Acid which PROMOTES inflammation. Confused? Let’s get straight to what to do about consuming a balanced ratio of Omega-3s to Omega-6s! Drinking them (or using them already hydrated) makes them very digestible so those 3’s get workin’ in the body rapidly! Soak the chia seeds in water until swollen then flavor as above- or as you desire. The are fabulous with fresh juices too! 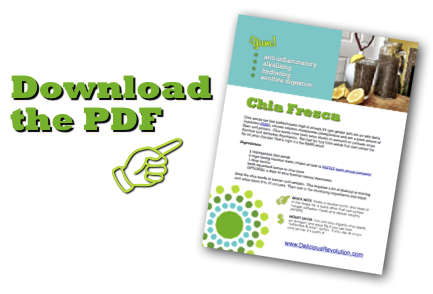 What is your favorite way to consume chia seeds. Share with us by posting your comments below. Great post! I actually bought chia seeds this morning. Love them! OK – I’m convinced! 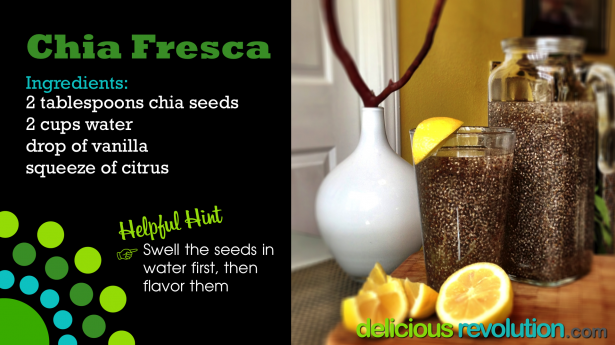 Preparing my first glass of Chia Fresca now. Way to go Monica! Not bad once you get past the jello-shooter feel! Can I blend the ingredients in the Vitamix or just stir and drink? Great question. You can blend them, but I prefer to allow them to soak and them drink them in all their jello-like glory! This makes them very digestable and ensures you get the least processed version of these powerful seeds. The texture takes getting used to for some people, but most end up enjoying it. I was out of lemons & limes today so I used orange. YUM! No sweetener at all and it tastes amazing. I always need energy so glad I found your site! I STILL need to jump on the chia seed bandwagon!